Taped to the wall above the couch where I place my students when they come to me for advice, homework help, and sometimes just to chat (when I’m alone in my room I’m usually either working at my desk or sitting on the tile floor… it’s cooler there), is a map of Indonesia I found in a tourist shop. I’ve always had a love for maps (there is also a map of the U.S. and my trusty beach-ball globe in my living room, and I turn to both constantly when I’m sharing fun facts and stories about friends with my students), and this map of the incredible country in which I find myself is probably my favorite part of my décor. 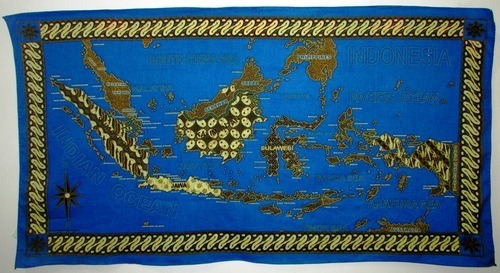 It is also a constant reminder of how vast and diverse Indonesia is. Though I want more than anything to be able to explore the far reaches of this country and find some way to piece together my understanding of its various complexities, there are not enough months in a lifetime, much less my grant period, to be able to do so. However, I have been able to catch glimpses of others’ experiences in different parts of Indonesia, by reading blogs not unlike my own. There are a total of thirty-five ETAs in my Indonesian Fulbright cohort, and many of them also keep blogs about their own experiences. If you would like to check them out, I have listed them below, organized by the island on which these ETAs find themselves. There is also a website, entitled Indonesiaful, that was started in 2012 and is maintained by current ETAs that includes articles of various kinds regarding our experience in Indonesia. I highly recommend it, as some of the ETAs who do not keep personal blogs have submitted articles, and because Indonesiaful is an ongoing project, and will offer perspectives on Indonesia for years to come.